Things have been so busy lately, I've had no time to write, or even think about writing. Art and life seem to intervene, preventing me from really engaging - in life and art - as though I'm suspended in a conundrum. Too perplexed to untangle my prevailing quandary, the other afternoon, I broke away from whatever I wasn't fully engaged in doing, to take the puppy for a walk. Granted, walking can be a catalyst for resolving creative blocks, but that idea was nowhere on my radar. This time, we went in the opposite direction down the same street as before (see post, below). As we passed the tree I'd encountered last time, the sun hit it from the west, lighting up the other side of the trunk. 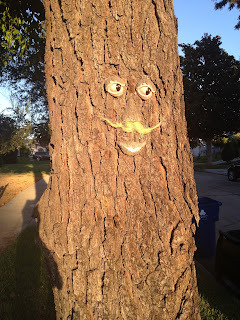 Imagine my astonishment, when I realized the tree had another face. A tree with a split personality. Two points of view! Could they be compatible? Forget about my own predicament. 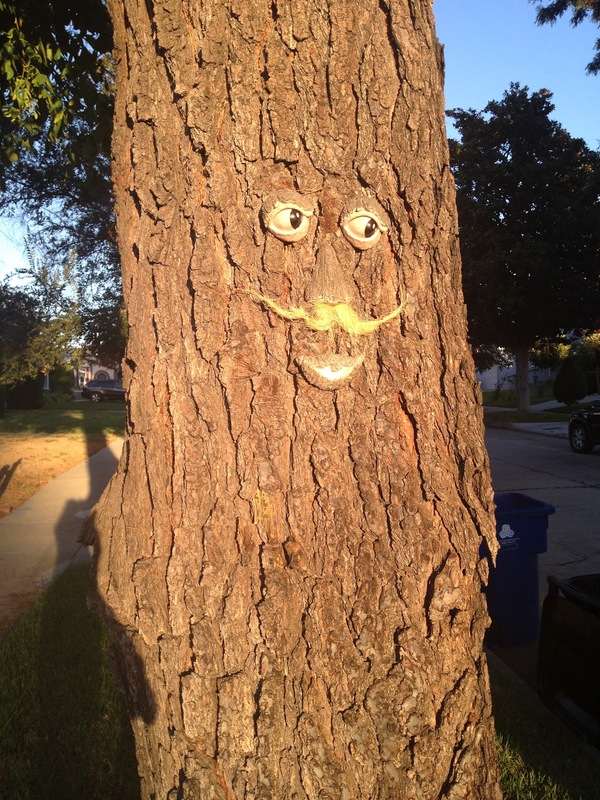 Now, I'm more concerned about the two characters who reside inside the tree. Have you had any interesting encounters while walking in your neighborhood? Just like people -- complicated and many-sided. And the rough bark you see on the exterior can mask the soft beauty of the interior. When I lived in North Hollywood, I encountered crack-heads, alcoholics and annoying skateboarders. One of my favorite encounters was hiking up a trail and hearing flute music. Then I saw a guy sitting high atop a boulder playing his flute to the sky.